HEIGHT, six feet two inches; weight, 200 pounds; age, 17 years; hobbies, hot rods and ice cream; I.Q., somewhere in the genius class. That’s Tenny Lode of St. Paul, Minn. The fact that Tenny could have entered college when he was 12 years old is not particularly unique. Children frequently pop up in the news with high I.Q.s and an ability to digest textbook knowledge at an astonishing rate. What makes Tenny unusual is his singular ability to understand electronics and use this knowledge to develop electronic instruments. He’s as familiar with vacuum tubes as baseballs and can read a circuit diagram faster than a comic book. 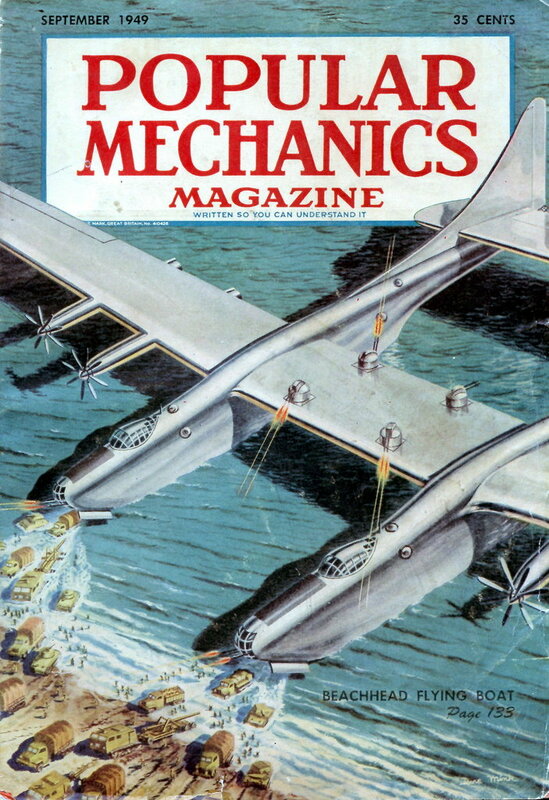 Take Tenny’s aircraft navigational computer. The 17-year-old senior at the University of Minnesota currently is working on a computer that definitely interests one of the bigger airlines and has attracted the attention of a large manufacturer. The indicator translates ground radio signals into a continuous navigational fix. Not long ago Tenny mailed off preliminary sketches of his computer to the Army Research and Development Board. They shot back a request for further information. As yet, Tenny doesn’t know what the board thinks of his latest creation. 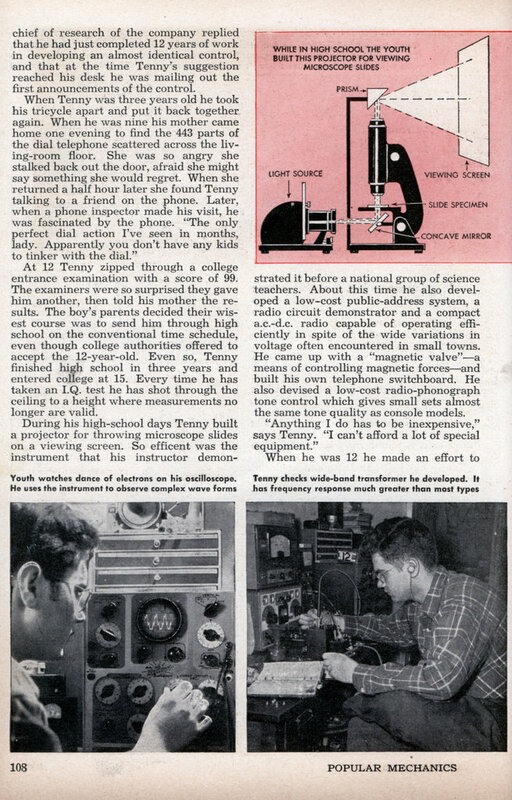 Last summer the research department of an instrument manufacturing company became interested in the navigational computer and even suggested that Tenny work in the company laboratory. Eventually, though, the legal department of the company turned thumbs down on any business agreement because Tenny is a minor. In Minnesota, a minor can’t be bound by a contract. At the age of 10 Tenny built his first instrument that showed real promise. He was confined to his bed with an attack that combined tuberculosis and a severe case of measles. (The attack left him hard of hearingâ€”he now uses a hearing aid.) He couldn’t operate his electric train from the bed except through a conventional remote control, and he figured the control didn’t give him enough flexibility of operation. Soon he rigged up his own control on a breadboard â€” a push-button system that could shuttle the train anywhere on the track. Visiting railroad fans were so excited about the device that they urged him to submit it to a large company which manufactures model-railroad equipment. The chief of research of the company replied that he had just completed 12 years of work in developing an almost identical control, and that at the time Tenny’s suggestion reached his desk he was mailing out the first announcements of the control. At 12 Tenny zipped through a college entrance examination with a score of 99. The examiners were so surprised they gave him another, then told his mother the results. The boy’s parents decided their wisest course was to send him through high school on the conventional time schedule, even though college authorities offered to accept the 12-year-old. Even so, Tenny finished high school in three years and entered college at 15. Every time he has taken an I.Q. test he has shot through the ceiling to a height where measurements no longer are valid. During his high-school days Tenny built a projector for throwing microscope slides on a viewing screen. So efficent was the instrument that his instructor demonstrated it before a national group of science teachers. About this time he also developed a low-cost public-address system, a radio circuit demonstrator and a compact a.c.-d.c. radio capable of operating efficiently in spite of the wide variations in voltage often encountered in small towns. He came up with a “magnetic valve”â€”a means of controlling magnetic forcesâ€”and built his own telephone switchboard. He also devised a low-cost radio-phonograph tone control which gives small sets almost the same tone quality as console models. When he was 12 he made an effort to solve this financial problem by starting the Lode Electronic Service â€” a radio repair shop with headquarters in his bedroom. During the next four years he repaired hundreds of radios and built some 20 radio-phonographs. He’s especially proud that three of the sets were purchased by music instructors, and that the Iowa State Teachers College ordered two specially designed jobs from him. Tenny plowed his profits back into his business, investing in such equipment as an oscilloscope. But his chief tools remain an old screwdriver, a pair of pliers and a soldering iron which he wields with the delicate touch of a surgeon over the kitchen table or a battered bench in his bedroom. Some of the lad’s friends once were annoyed by pigeon roosts, so Tenny whipped out a pigeon eradicator using high-frequency sound. The noise so disturbed the pigeons that they immediately departed, yet the horn was so high-pitched humans couldn’t hear it. Tenny was about to sell this invention when he read of a man out West who had developed a similar instrument. So the pigeon eradicator’s parts now are installed in other instruments. A couple of years ago he worked out a film-developing system, only to discover that the same system had been used 10 years previous. Tenny’s biggest trouble is that frequently he doesn’t build a model complete enough to demonstrate to others. Sometimes the reason is lack of funds; often it is because ideas fascinate him but end products hold little interest. Once he has determined the validity of an idea, he’s off on a new project. If he can prove to his own satisfaction that ultimately the idea will work, he immediately finds something more interesting. The lad’s ideas are not confined to the field of electronics. For example, he’s now working on a system for projecting movies in three dimensions without the need for special viewing lenses. One of the reasons we see in three dimensions, he points out, is that each eye sees a different picture. Actually, when we focus on an object we see two images of every other object within view. If we focus on our forefinger, we see two of everything that appears in the background. To apply this effect to motion pictures, Tenny has rigged up a mirror and prism arrangement that he places in front of the camera. When the film is exposed and developed, everything on the focal plane of the camera appears in focus, but everything behind or in front of the focal plane appears as two overlapping images, with the distance between the images varying depending upon how far the objects are from the focal plane. When the film strip is run through the projector, there’s a definite three-dimension effect. Crude, admits Tenny, but he feels that it may lead to something bigger. He now is tinkering with binaural sound effects using only one microphone. Other projects include a precision temperature control he hopes will be efficient to one-thousandth of a degree, and a “memory tube” that would operate through an ordinary vacuum tube instead of the larger tubes used for that purpose in modern computers. He’s remodeling his oscilloscope to show five, six or even 10 different wave forms simultaneously for purposes of comparison. Like many other laboratories across the country, the Tenny Lode bedroom lab is working on an electrostatic loudspeaker for producing high-fidelity sound. Tenny’s model, unlike some of the more pretentious instruments, works. Its parts include a sheet of carbon paper and a strip of screen wire. He also has developed a high-fidelity, multi-channel communications system and has an idea for a low-voltage television tube that would slash the cost of television projection in theaters. Except for his interest in physics and other sciences, the youth is just about as normal as any lad could be. He likes hotrod racing (he just sold his souped-up ’35 car) and has a blond girl friend he’d be “proud to have you meet.” He’s just as interested in the behavior of players on a football field as gases in a high energy field, and when he’s not observing wave forms on his oscilloscope you’ll likely find him in the center of a bull session with his cronies.